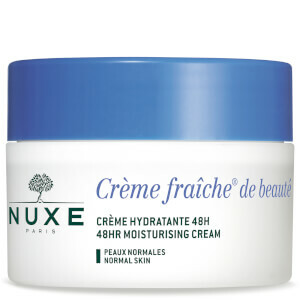 Keep skin safe and hydrated with NUXE Crème Fraiche de Beauté Moisturiser for Dry Skin, a rich formula that delivers 48 hour moisture whilst shielding against urban pollution. Ideal for dry skin types, the comforting moisturiser melts effortlessly into skin, softening, soothing and protecting with its dose of Vegetable Milks and Algae extract; skin is safeguarded against damaging environmental pollution and is left feeling soft, fresh and hydrated. Apply morning and/or evening on face and neck. Ideal after serum, as makeup base.